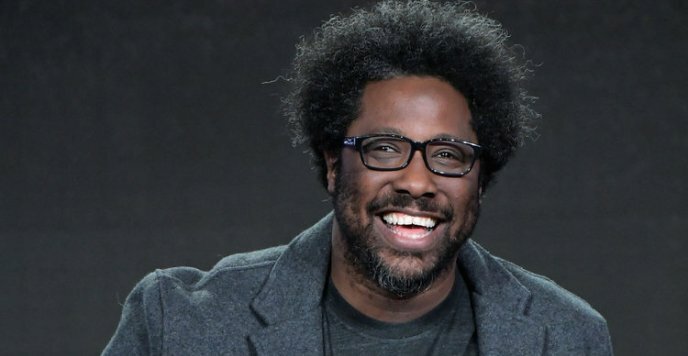 In the first season of his CNN documentary series United Shades of America, comedian W. Kamau Bell walks a line between discussing polarizing social issues like gentrification, the prison system, racism and even spring break without making fun of or belittling his sources. These experiences, as well as the time he’s spent touring the heartland as a stand-up comedian, has given him an insight into what makes our country tick that most liberal-minded coastal elites cannot fathom. “As the profit Drake says, what a time to be alive,” laughs Bell, who wears a shirt that reads “Give all the damns,” while he and other stars of CNN’s documentary lineup visit journalists at the network’s Television Critics Association press day last Saturday in Pasadena, Calif. Ahead of both United Shades’ second season and the first years of Donald Trump’s presidency, Bell spoke about the importance of listening to each other. 1. Bell thinks people in the arts need to step up their game during the Trump presidency. “A lot of my friends sort of say they wish they wished they lived through the ‘60s. Now’s your chance,” Bell says. “I think now there’s really a chance for the arts to do what the arts do best, which is deconstruct and try to explain what’s going on in the world. I was going to say that I was looking forward to [the inauguration], but that would be a lie. 2. He has heard from those who participated in last season’s KKK episode. He says he and his show’s producers also made sure not to show the children who were at the “cross lighting” (which he was taught was the proper term). 3. United Shades’ intent is not to mock. 5. Bell was not shocked by the outcome of the U.S. presidential election. Whitney Friedlander is an entertainment journalist with, what some may argue, an unhealthy love affair with her TV. A former staff writer at both Los Angeles Times and Variety, her writing has also appeared in Esquire, Elle, Complex, Vulture, Marie Claire, Toronto Star and others. She lives in Los Angeles with her husband, son and very photogenic cat.